Victoria and Albert Museum in London, Stella unveiled two new pieces created in collaboration with Bolt Threads and ColoriFix of the museum’s latest exhibition; Fashioned From Nature. Born on 13 September 1971 in London, Stella Nina McCartney was the second child of Beatles star Paul and his wife Linda. The designer showed a penchant for fashion from a young age, interning with Christian Lacroix in her teens, before studying at Ravensbourne College of Design and Communication and Central Saint Martins. In 1997, she was appointed as the creative director of Chloé, a move that her predecessor, Karl Lagerfeld, criticised. “Chloé should have taken a big name. They did, but in music, not fashion. Let’s hope she’s as gifted as her father.” Despite her legitimate qualifications, McCartney has been frequently criticised for calling on her family connections. However, in 2001, when she left Chloé to establish her eponymous fashion house, it was with the financial backing of conglomerate Kering, not her father. Together, Kering and McCartney enjoyed critical acclaim and commercial success – in 2016, turnover rose 31% to £41.7m, while profits increased 42.5% to £7m – until March 2018, when McCartney bought Kering out, making her brand independent for the first time. McCartney’s designs are free from any materials derived from animals. “I was kind of ridiculed. I know people thought I was nuts – how can you go into the fashion industry and not use leather?” she told Vogue in 2017. In 2012, she walked away with designer of the year and brand of the year awards at the British Fashion awards. She was appointed an OBE in the 2013 New Year honours list for services to fashion. She collected the award with her husband, Alasdhair Willis, with whom she has four children, Miller, Bailey, Beckett and Reiley. Her own glossy image – in a classic camel sweater and elegant white trousers worn with very high-heeled vegan court shoes she is, as always, lightly tanned and subtly blow-dried – is a world away from what she terms the “crochet your own sweater and carry a hemp handbag” cliche of eco-fashion. She combines a fiery outrage at fashion’s environmental footprint – “1% of clothing is recycled! Only 1%. I mean, what are we doing?” – with a relentless upbeat passion for beautiful clothes. Many of fashion’s great artists have been obsessed with nature. Christian Dior was a knowledgable gardener who channelled his passion into pieces such as his 1952 Vilmorin dress, hand-embroidered by the house of Rebe with thousands of tiny daisies. Alexander McQueen dressed women in dresses of razor clam shells, headdresses of antlers and shoes modelled on armadillo hooves. But the relationship has a dark side, from the fur trade to the monumental environmental impact of a global fashion industry that expends the Earth’s resources on clothes that are surplus to requirements. A survey of 2,000 British women by Barnardo’s last year found that the average piece of clothing was worn just seven times before being thrown away. 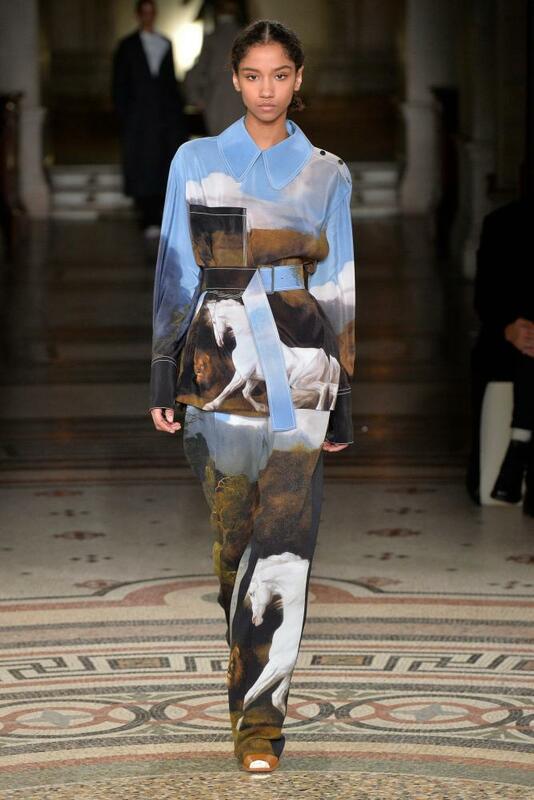 A Stubbs-inspired Stella McCartney outfit. Earrings made from birds at the V&A show. An exhibition is always telling a story about the era it is staged in, as much as about the past. Fashioned from Nature spans a time period from 1600 to the present day, but it is a very different show than it would have been even a decade ago. Awareness has grown exponentially around the environmental impact of the fashion industry, which produces greenhouse gas emissions of 1.2bn tonnes a year, larger than that of international flights and shipping combined. To tackle this, “we need to completely rewire the hierarchies of fashion”, says Ehrman. The mindset by which a dress made up of rare materials imported from far-flung corners of the globe is the first to be put in a museum is finally being challenged. The emotional trigger of ethical fashion has long belonged to animal rights. McCartney’s refusal to use leather and fur is the one fact everyone knows about her. 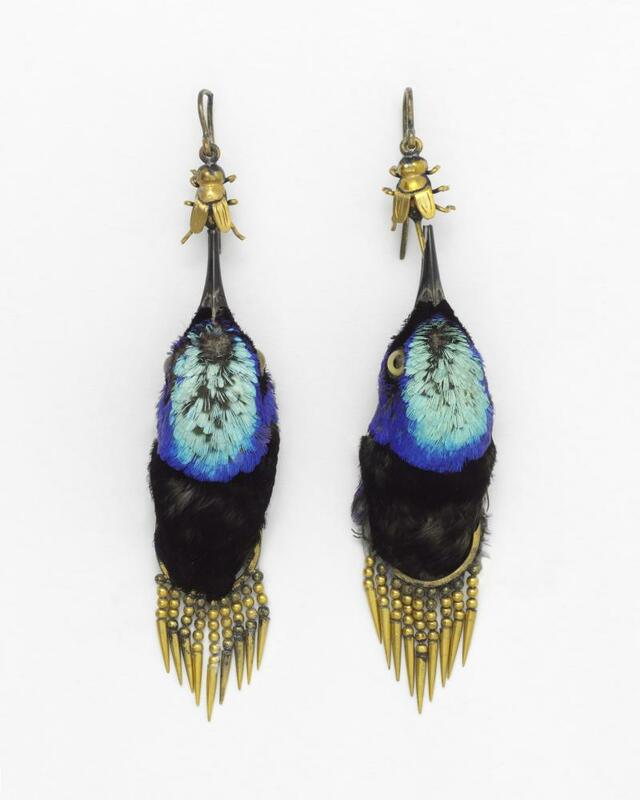 Many of the most startling exhibits in Fashioned from Nature are those for which animals have grotesquely suffered: a pair of Brazilian red-legged honeycreeper birds made into earrings, their tiny bodies dangling like pompoms, would have been a prized accessory for a fashionable woman of the late 19th century. 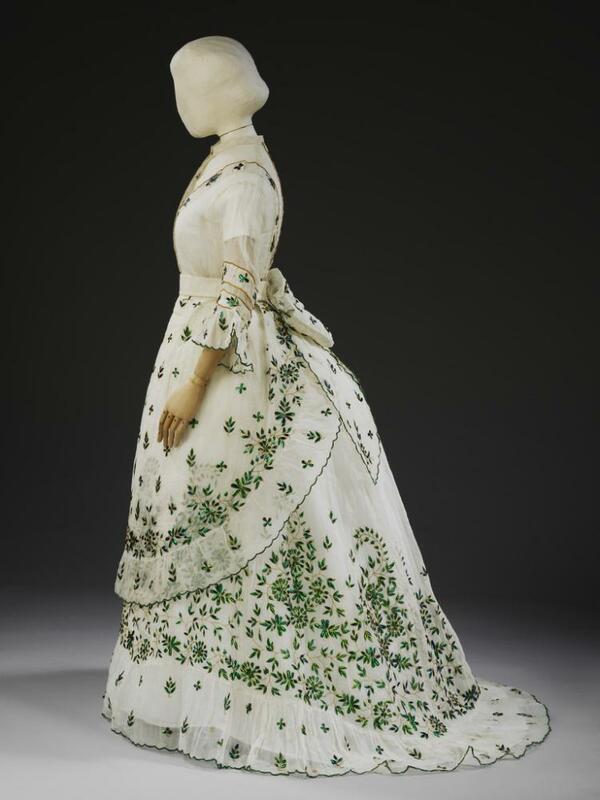 A dress made in the 1860s features embroidered “flowers” with the petals made up of about 5,000 iridescent green beetle wings, most of which would have been harvested from live beetles. The dress made from beetle wings. But as awareness of animal rights pushes fur towards being a footnote in fashion history, fast fashion has become the focus. The poor record of workers’ rights in the production of fast fashion, its convoluted supply chains, environmentally reckless dye processes and short wardrobe life make cheaply produced garments the villain of the modern fashion piece. The circular economy is the buzz phrase in the industry – McCartney recently partnered with the RealReal, a resale company, to encourage shoppers to keep clothes in circulation by selling them on. But the issue cannot be tackled on a meaningful scale until it engages with the consumer who has neither the budget for designer fashion nor relatives dropping off piles of hand-me-down cashmere.